There’s a strong performance rattling around in “Vox Lux,” a slice of European-influenced misanthropy about the unsteady rise of a rock star — and that performance doesn’t belong to the marquee name, Natalie Portman. Instead, it’s the actor who plays Portman’s pop-diva character Celeste as a teen, Raffey Cassidy, who’s most impressive in actor-turned-director Brady Corbet’s brooding, self-satisfied drama. The story starts in 1999, with 14-year-old Celeste and her older sister Ellie (Stacy Martin) sitting in their high school orchestra class. Then a troubled student walks in, shoots the teacher dead, and threatens the students with the same fate. The aftermath of this Columbine-esque school shooting turns out to be the launchpad of Celeste and Ellie’s music career. They write and perform a melancholy tribute song for the memorial service, which becomes a viral sensation even before “going viral” was really a thing. The public is especially taken with Celeste, who was shot in the neck during the massacre, and wears a metallic neck brace to keep the bullet still lodged inside from moving. Soon, the sisters have a savvy manager (Jude Law), and are on the road to becoming famous. At least Celeste is becoming famous; Ellie is content to back up her sister and write more songs. In the second act, Corbet — who wrote and directed, sharing story credit with girlfriend Mona Fastvold — shifts to 2017, as Portman’s now-adult Celeste prepares for the start of her world tour and the inevitable press gauntlet that goes with it. Celeste has a lot going on before the first show. She’s trying to connect with her teen daughter Albertine (also played by Cassidy), whom Ellie has raised. She’s trying to score a high with her manager. And her publicist (Jennifer Ehle) tells her that gunmen in Croatia shot a crowd of beachgoers, and the shooters were wearing masks from Celeste’s last music video. Corbet has worked with a lot of iconoclastic European directors, including Michael Haneke (“Funny Games,” 2007), Lars Von Trier (“Melancholia,” 2011) and Olivier Assayas (“Clouds of Sils Maria,” 2014) among them. A lot of their influence seems to have rubbed off on Corbet, and some of his tricks — like his combination of static long shots and one-take conversations — feel like something in a pretentious European film. Corbet can’t do much to contain Portman, who depicts Celeste as all sneering attitude and the most overwrought Brooklyn accent since Viggo Mortensen wrapped on “Green Book.” He has better luck with Cassidy, drawing not one but two soulful, wrenching performances — first as the shell-shocked young Celeste, then as the exasperated daughter of the pampered rock star. 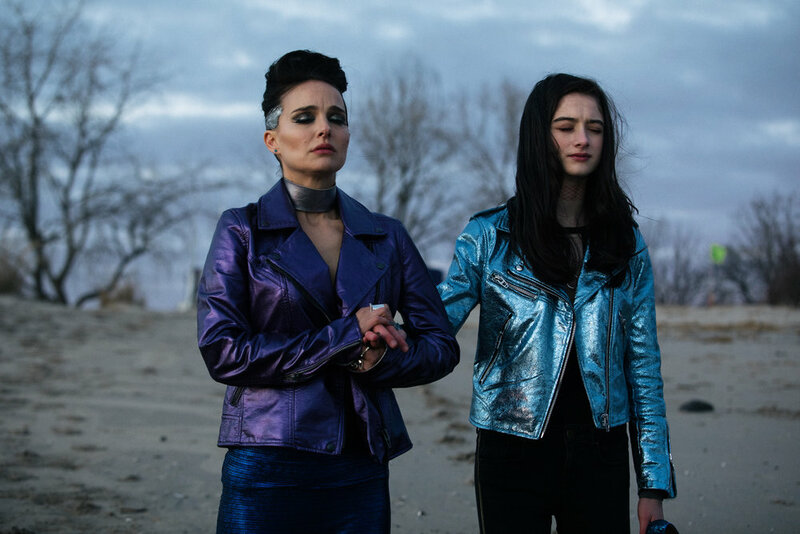 The saddest thing about “Vox Lux” is that Corbet shows potential for greatness, only it’s too little, too late. The movie ends with Celeste’s concert performance, where all of the rock singer’s neuroses and demons are crystalized and vanquished through the power of music and stage theatrics. If more of the movie were like the last 10 minutes, “Vox Lux” would be a masterpiece. Opened December 7 in select cities; opens Friday, December 14, at the Broadway Centre Cinemas (Salt Lake City). Rated R for language, some strong violence, and drug content. Running time: 110 minutes.